To understand the impacts, and find compromise solutions between human and animal needs, the researchers focused on insects, sea turtles, salmon and Newell’s shearwater, a seabird, for which existing data were readily available. 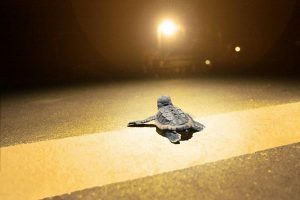 They found that the worst nighttime lights are intense blue and white colors – some affect species as much as the brightness of midday sun – and three times more than yellow or green lights designed with wavelengths less disruptive to wildlife. C&W Energy Solutions, LLC, provided seed funding for the investigation, but did not participate in research or reporting results. Rodríguez was supported by a Marie Curie International Outgoing Fellowship (330655 FP7-PEOPLE-2012-IOF) and a Juan de la Cierva contract from the Spanish Ministry of Economy, Industry and Competitiveness (IJCI-2015-23913).